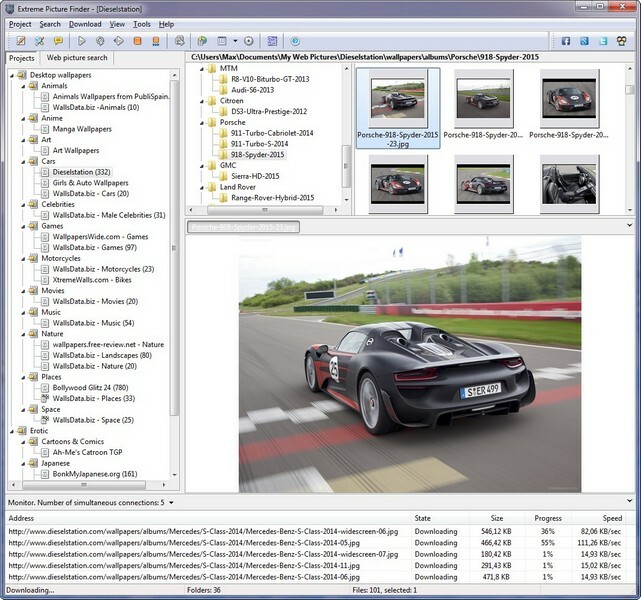 Extreme Picture Finder - Easily find and download multimedia content! Download photos, music, video or any other files from almost any website automatically. Simply enter the website address, choose what files to save, select a folder on your hard disk and let the program do the rest for you. No banners, no pop-ups, no annoying ads - only files you want and where you want them! The program's intelligent spider can easily handle password-protected websites, TGP, forums. Plus you can set minimum and maximum file size, use URL filters to exclude unwanted content, choose the way the files are named when they are saved and use many, many other options to get exactly what you want as fast as possible. Another feature of Extreme Picture Finder that makes it really unique is a possibility to search the web for pictures using any keyword or key phrase. It can find thousands of pictures almost instantly - just type what you want and you have it! But this is not all. Extreme Picture Finder comes with a free library of website addresses which is constantly updated. All addresses are stored in categories and you can start downloading files from any website of the library with just a couple of mouse clicks!